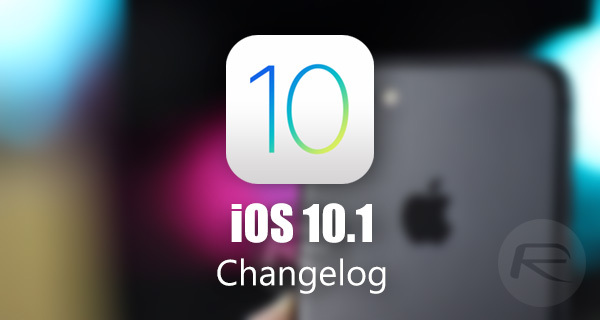 Here’s the full iOS 10.1 official changelog (also known as release notes) that Apple has released today for iPhone, iPad and iPod touch devices. It’s one thing receiving the notification on your iOS device to alert you to the fact that Apple has pushed out a software update, but it’s another thing altogether to actually know and understand what’s included in that release. We take a good look at what has changed with this latest iOS update, and what it means for your compatible iPhone, iPad, or iPod touch. Apple’s iOS 10.1 software, which is the first major update to iOS 10.0.x which went live last month, has been in the hands of developers and registered testers for quite some time now, giving them the ability to not only put the platform through its paces, but to also ensure that any issues are fed directly back to Apple in a timely fashion. That level of interaction has involved essentially stress testing iOS 10.1 to ensure that it’s in the necessary position to be released to millions of eager devices on a global scale. As we probably know by now, the largest addition, and definitely the most exciting change to iOS 10.1 is the introduction of the Portrait mode camera function for iPhone 7 Plus. As Apple points out, that new feature “creates a depth effect that keeps your subject sharp while creating a beautifully blurred background.” This feature may still be classified as being in beta by Apple, but it looks to work extremely well and is definitely streamlined enough to make it a worldwide and very open beta process. From a Camera and Photos perspective, Apple has also made some changes to how photographs are stored in iCloud backups, and also introduced improvements to how wide color gamuts are displayed in the Photos app grid view. Given that Maps and Messages were two very important parts of the overall iOS 10 experience, it shouldn’t come as a surprise that Apple has also focused engineering efforts on improving these two key apps with iOS 10.1. The full changelog, or release notes if you prefer to call it that, can be found below, giving you an exhaustive overview of everything that has been added with the latest major software release by Apple. For those that have a compatible iPhone or iPad, the iOS 10.1 update is available to download as an over-the-air update right now. No mention of the Touch ID issue with iPhone 5’s. Just downloaded all my Apple devices with new software the day it came out. Try that with anything running Android. Is there ANY kind of smart phone that you like? Or are you still using your dad’s old Motorola DynaTAC? iPhone 4S was the last good iPhone. RIP SJ.